Some people swear by adding a rug to the dining room and others say it's a huge no-no, but today, we are going to tell you why we, as well as a large majority of interior designers, are firmly pro-rugs! We understand why people might be a little hesitant to add a floor covering to a dining room, after all, it's a space that is frequently messy and food spills are not something you want to leave to soak into any depth of carpet pile, but the aesthetic is hard to beat! Not only that; a gorgeous and well anchored rug will really add a sense of grandeur and ceremony to a dining too, but don't just take out word for it. We've come up with a host of fantastic reasons why you need a rug underneath your dining table, so let's take a look and see if you're inspired to get onboard! Rugs under dining tables are natural space definers. If you haven't opted for an open-plan kitchen and dining room but do have a less constricted ground floor, you still need to allude to where all of the different zones are. After all, you don't want the functionality of your dining area to spill, literally, over into your living room, do you? By selecting a rug that showcases a contrasting color to the rest of the space, you can achieve the look of a soft perimeter that encapsulates the dining table very neatly. We have a real affinity for these vintage-looking Persian style rugs, as they work with almost any decorating scheme. A rug can divide your open-plan kitchen and dining room. If you're fortunate enough to enjoy an open-plan dining room and kitchen area, it can be hard to know where one ends and the next begins. Naturally, there is an intrinsic connection between the two different zones, but it never hurts to properly mark out the alternate areas and that's where a fantastic dining table rug comes into play! 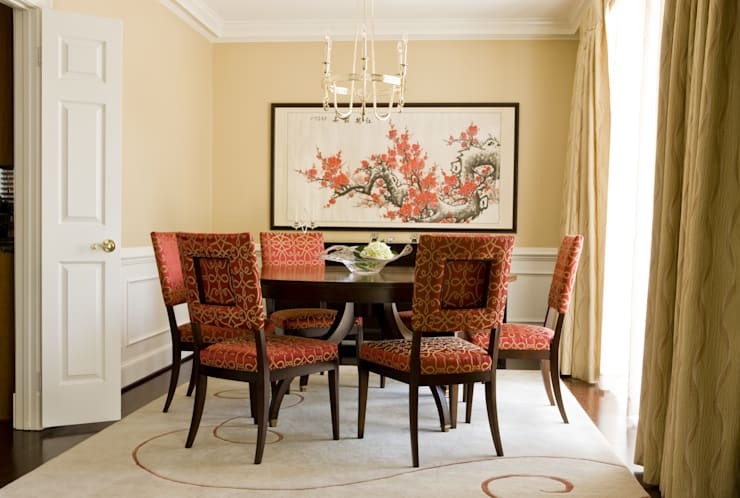 By placing your dining table on top of a well proportioned, eye-catching and color-coordinated rug, you are effectively marking out the boundary lines of where you eat. It's a simple technique and requires no permanent dividing structures, but it has a huge impact on the way an open-plan room will look and feel. Nothing feels more luxurious than deep-pile carpet! Who doesn't love the feel of deep-pile carpet underneath their feet? 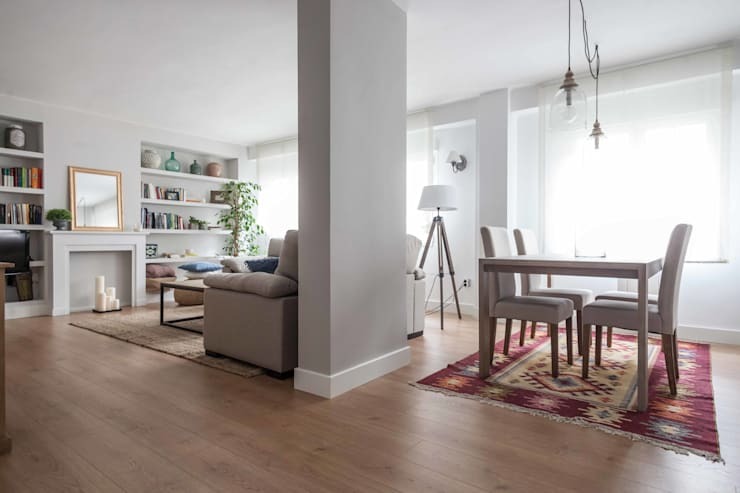 The problem is, carpet has gone, not out of fashion exactly, but wooden flooring is definitely more popular these days, so why not look for a way to have the best of both worlds? If you've opted for hardy and easy to clean flooring throughout your home, add a really soft and luxurious rug underneath your dining table and enjoy the contrast of textures. as you sit and enjoy your food, you can gently rake your toes through the pile and not miss out on any of the elegance and opulence that an expensive carpet offers. Plus, a high-end rug will really elevate your dining furniture too! Talk about making everything look very expensive! A large rug creates a sense of increased space. A big concern, if you'll excuse the pun, when it comes to rugs, is what size you should be choosing. If you take away just one piece of advice from us, please let it be to opt for a larger rug than you think you need! It will look great and creates a sense of more floor space too. A good rule of thumb is to measure how big your table and chairs are and try to add at least 30cm all the way around. Don't worry that this will effectively shrink the room, as it will merely increase the perceived dining area. You will also be able to protect your flooring from scratches and damage. Dining table rugs add valuable contrast. Wow! Just look at the way this rustic dining room really pops! It's thanks to the use of plenty of different patterns and the main amplifier is the terrific rug that has been anchored down by the table. This brings us onto the next issue that you need to think about in terms of rugs. If you are worried about choosing a rug that is perfectly coordinated to your room, stop! 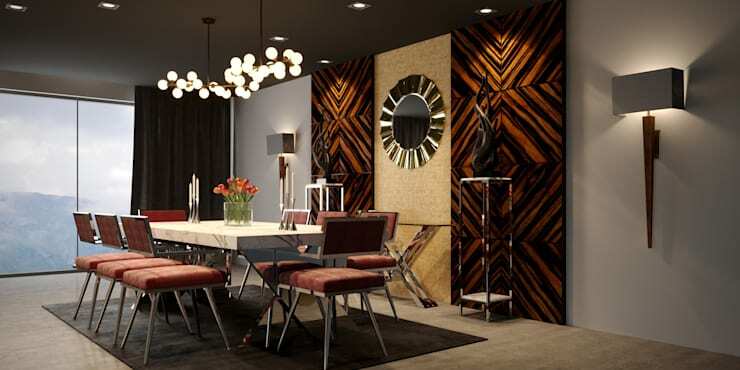 Given that dining tables are usually such large and forthright pieces of furniture, you can definitely stand to add some pattern or color contrast underneath and it will still work well with a different design scheme. Take this room as a perfect example of what we mean! The room is rustic, but the rug is traditional and the finished aesthetic is perfectly charming! 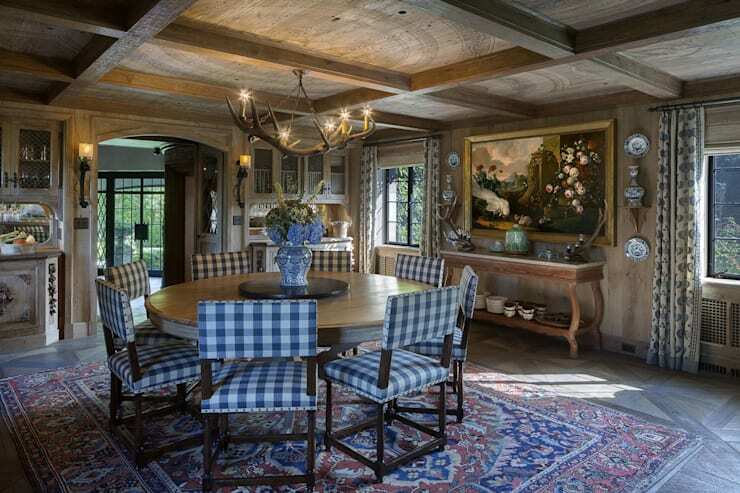 A well-placed dining room rug will complete a theme. If you're not exactly onboard with the idea of adding a rug as a contrast in your home, how about choosing one that will finish a theme and tie it all together perfectly? The simplest way to do this is to select a one-color rug that aligns with the boldest hue in the rest of the room. This tends to be the darkest color. The only thing you need to try and do is make sure that the legs of your chairs and dining table are not the same color as the rug itself or there will be little to distinguish between them! Why not enjoy a little more textile inspiration by taking a look at this Ideabook: 11 lovely carpet placement ideas for different home spaces!